This wall mounted vacuum cleaner is extremely powerful and has a variety of cleaning applications, both residential and commercial. It mounts quickly and easily to the wall with no plumbing necessary. The Garage Vac is Made in the USA by Lindsay Manufacturing, a manufacturer of central vacuums since 1956. 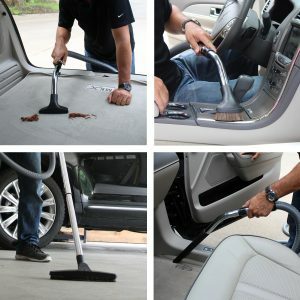 Comes with a 30ft or 50ft hose and cleaning tools for use inside the garage or out in the driveway. It mounts quickly and easily to the wall with no plumbing necessary. Simply attach the hanger bracket to the stud, slide the unit onto the wall, plug it in and you are ready to clean. It’s so simple and clean to change the 7 gallon HEPA bag.